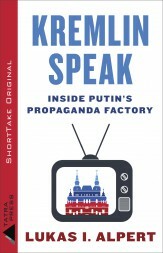 If you thought Moscow’s propaganda campaigns ended with the Cold War, think again. The Kremlin’s efforts to influence global discourse has only grown more sophisticated with the creation of state-run, English-language broadcaster RT. Leading the charge of several increasingly polished, government-run, English language channels, RT has won fans by billing itself as a network willing to challenge the narrative offered by traditional broadcasters like CNN and the BBC and give a voice to stories mainstream media ignores. But a closer look reveals that it is really a slick disinformation tool aimed at furthering Russia’s foreign policy objectives by denigrating the West at all costs. Alpert is a reporter for The Wall Street Journal, previously based in the Moscow bureau and currently living in New York.